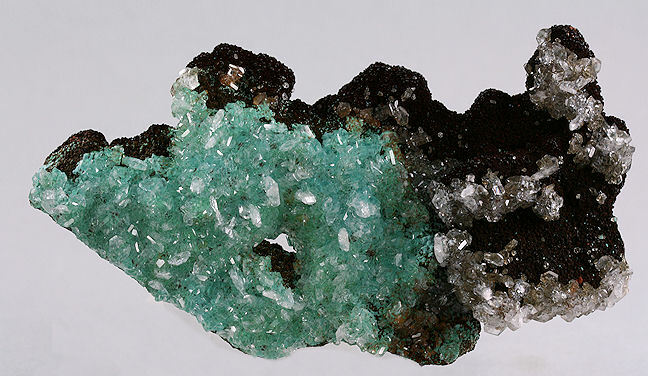 Check out the mineral specimens on this page. 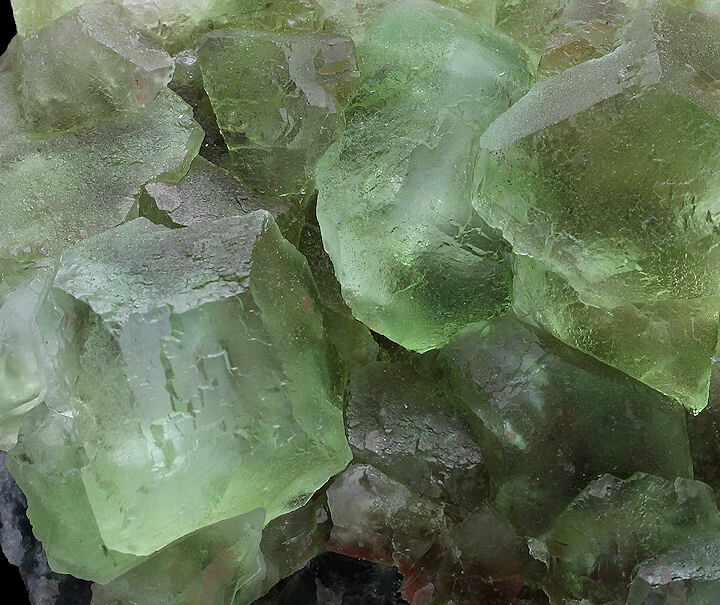 Gemmy, lustrous, apple-green Fluorite cuboctahedrons with frosted faces. 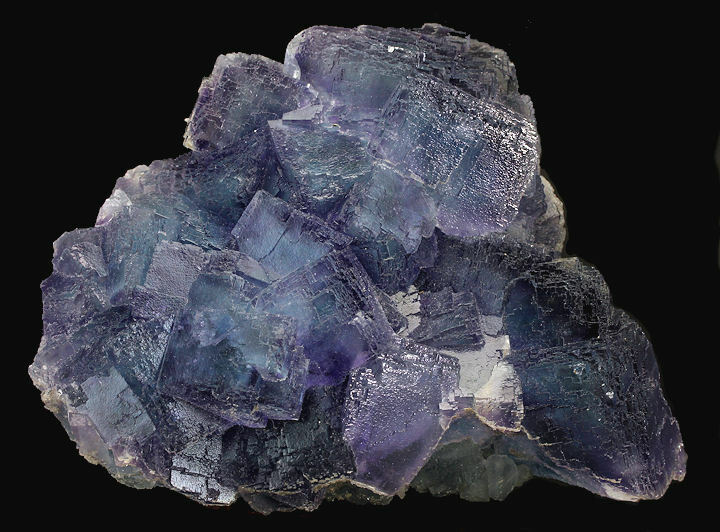 Crystals reach 4.0 cm on teal blue massive Fluorite. 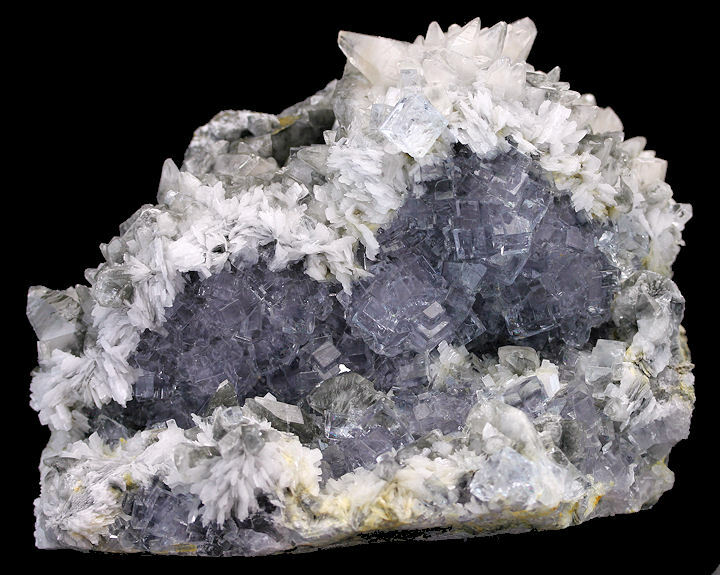 A fine La Viesca Mine blue Fluorite crystal cluster with purple zoning and great luster. In excellent condition. 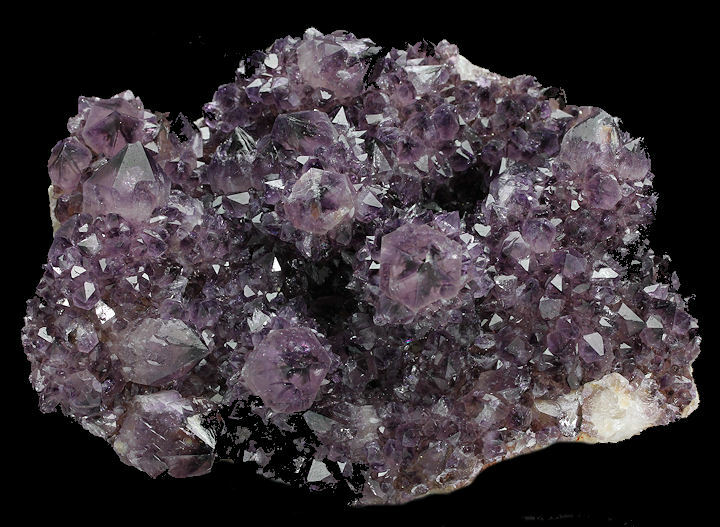 A very nice, large plate of "starburst", purple Amethyst crystals in very good condition. 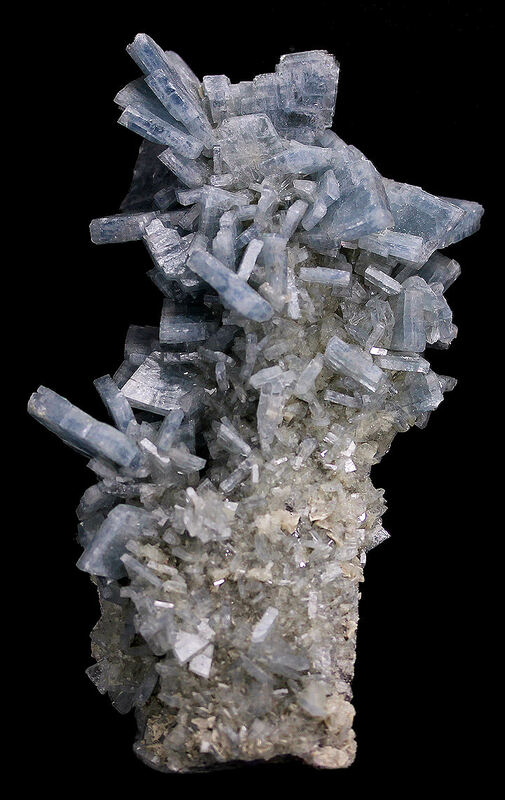 This is the finest specimen of blue, tabular crystals of Barite ever offered on this site from the famous Moscona Mine. 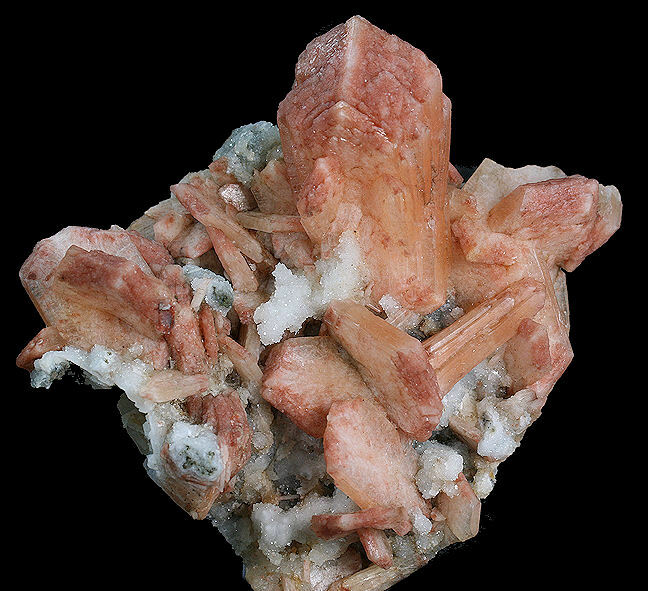 Ii presents well on front and back side, with some Dolomite rhombs on the latter. In excellent condition, which is rare for these specimens. 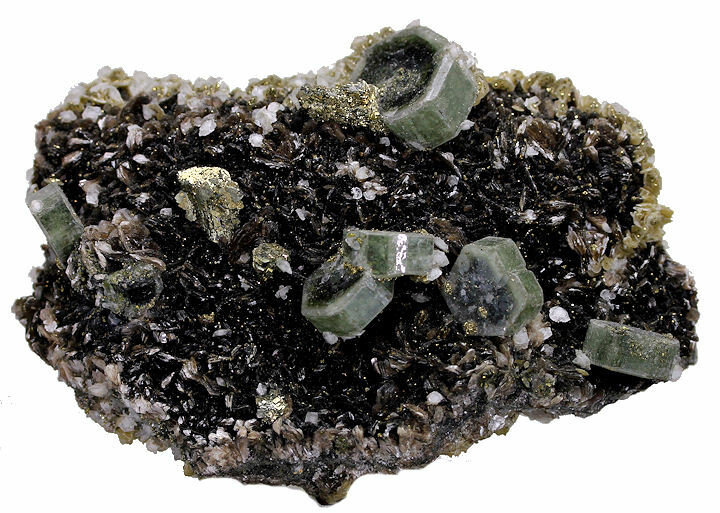 A super Panasqueira specimen with Apatites (to 2.5x1.75x1 cm), Muscovite, Arsenopyrite, Pyrite & Calcite. Difficult to photograph and even better in person. 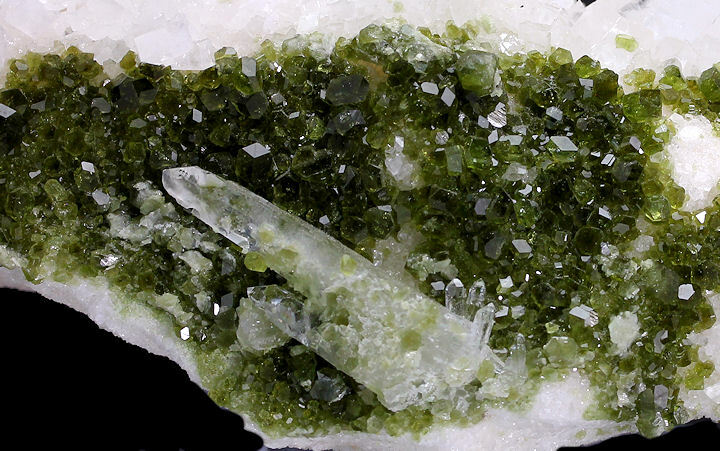 Panasqueira has yielded many of the best Apatites in the world, but this mine is not only known for Apatites. 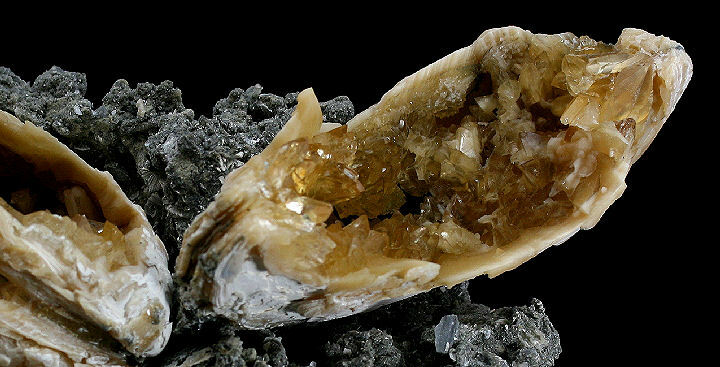 It has produced a exceptionally large suite of other minerals that also rank among the very best for the species. 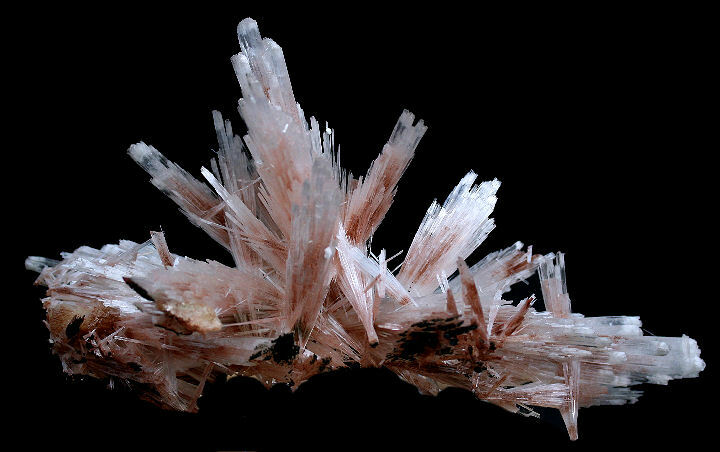 However, the amount of fine crystallized different minerals one can find in just one specimen is what sets apart this locality. 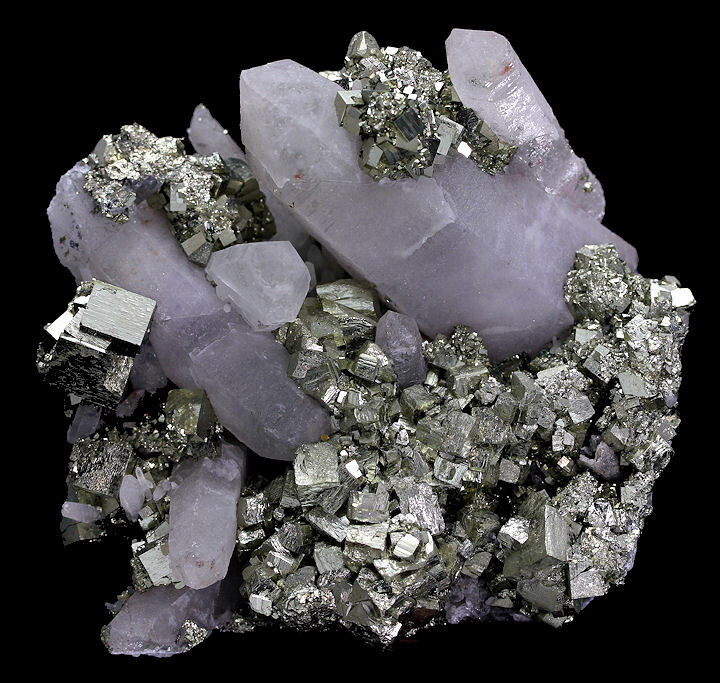 A solid mass of silvery Pyrite crystals with intergrown, light Amethyst crystals. 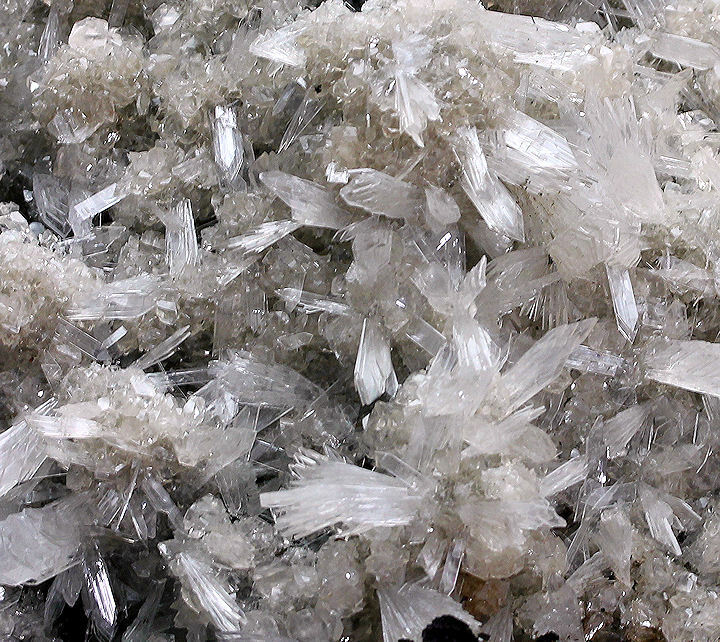 Hundreds of fine, glassy Hemimorphite crystals on a matrix of Limonite. 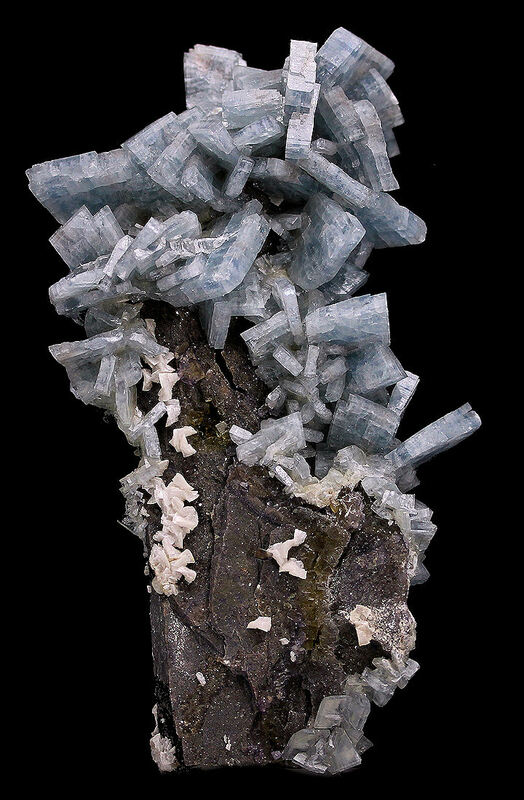 Named Hemimorphite because of the hemimorph development of its crystals. 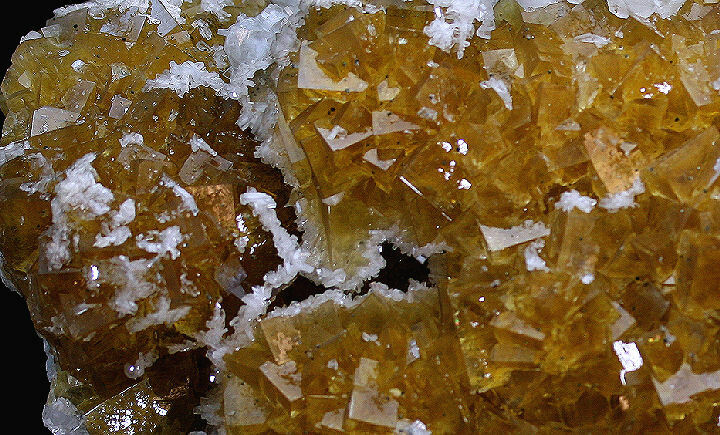 This unusual form, which is typical of only a few minerals, means that the crystals are terminated by dissimilar faces. 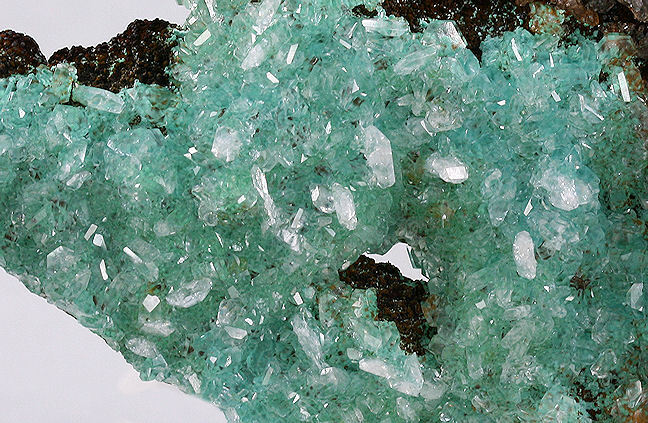 Very aesthetic combination of gemmy, green Uvite crystals partially covering a cluster of Magnesite rhombs with some adorning Quartz. 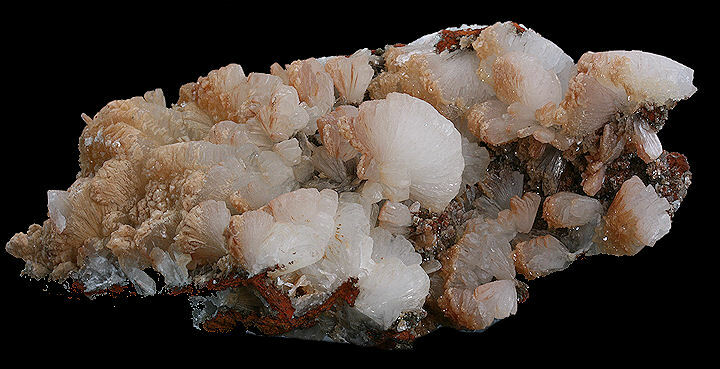 Numerous, delicale, glassy, rosette- like, mini-clusters of Calcite on a heavy matrix of Goethite. 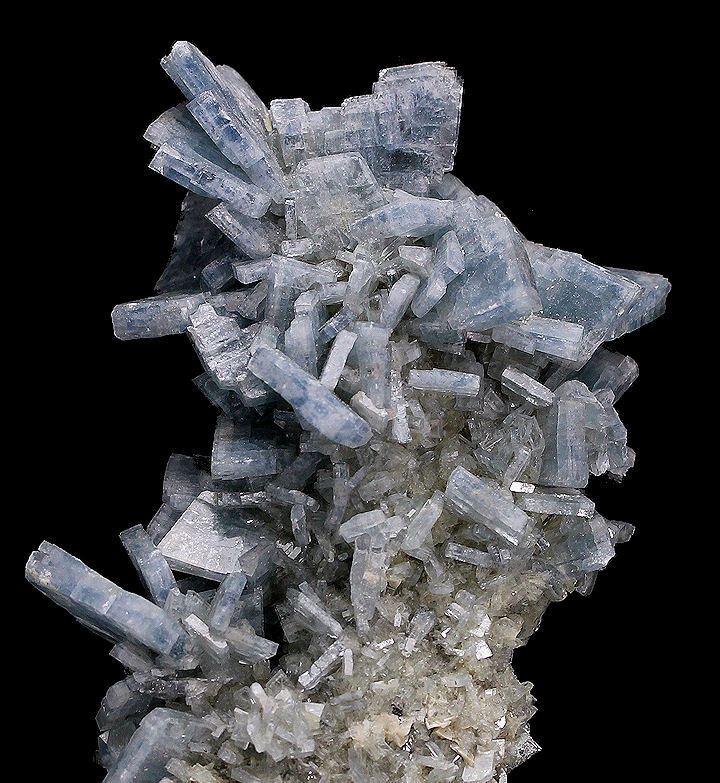 Very uncommon specimen. 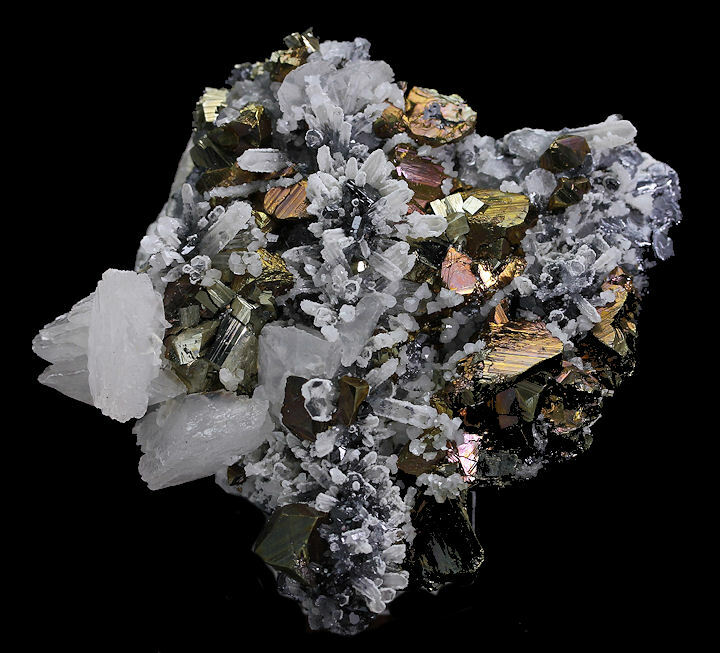 Attractive specimen of sharp, golden Chalcopyrite crystals with Calcite and Quartz. 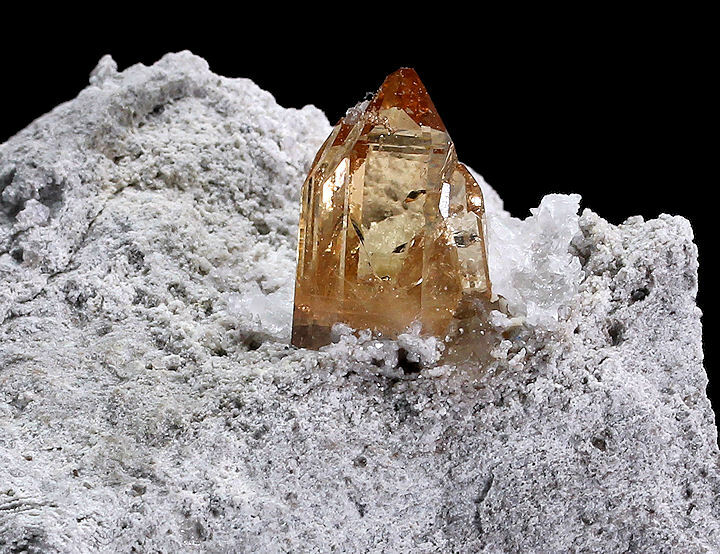 Gemmy, amber colored Topaz crystals (to 1.5x1 cm) on Rhyolite matrix. 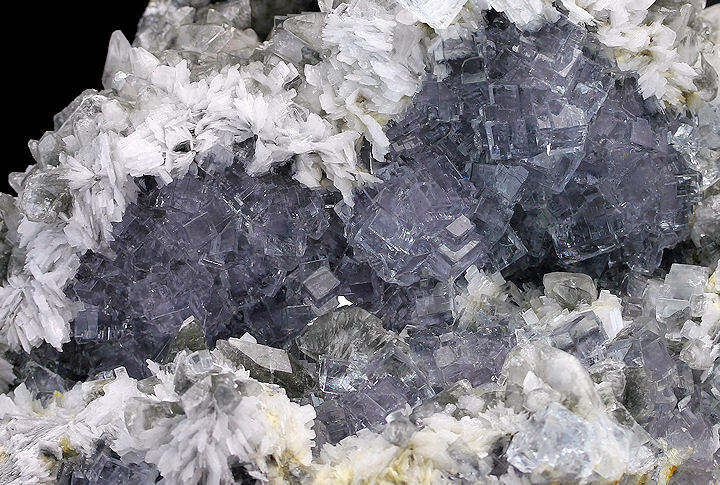 Lavender colored Fluorite crystals surrounded by snow white Barite blades and scattered Calcite crystals. Very aesthetic and in fine condition. 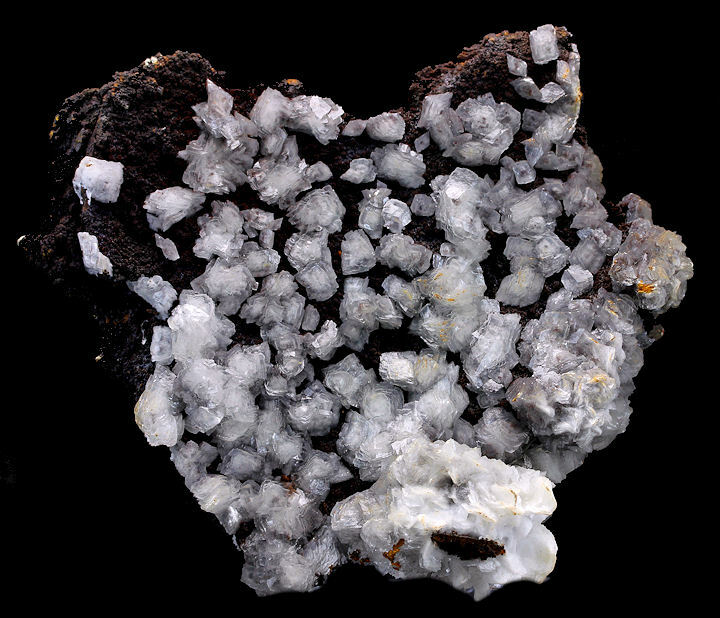 Large grouping of clear to translucent Celestine crystals on matrix. 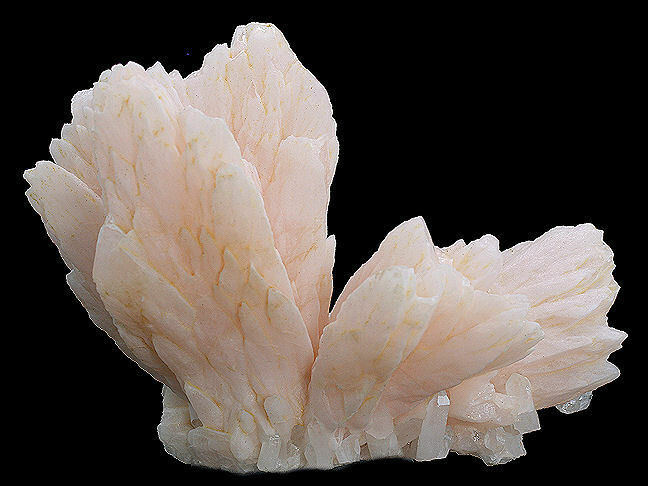 A gorgeous burst of light pastel pink Calcite crystals up to 9cm in length. This is a very hard to find classic old Colorado specimen. 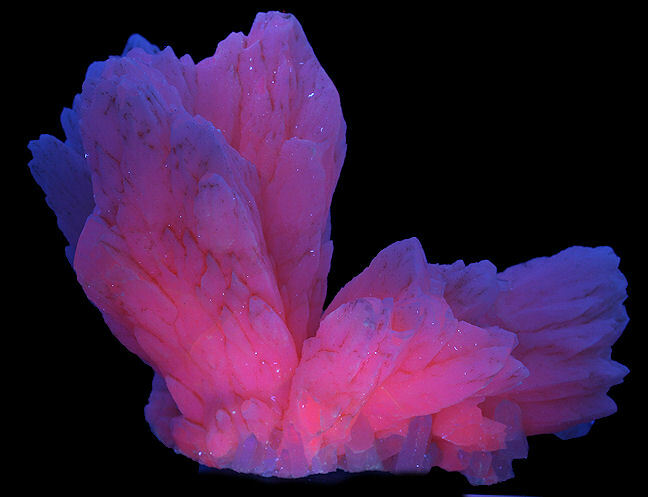 It is highly fluorescent. The San Juan Mountains are a rugged mountain range in the Rocky Mountains in southwestern Colorado. 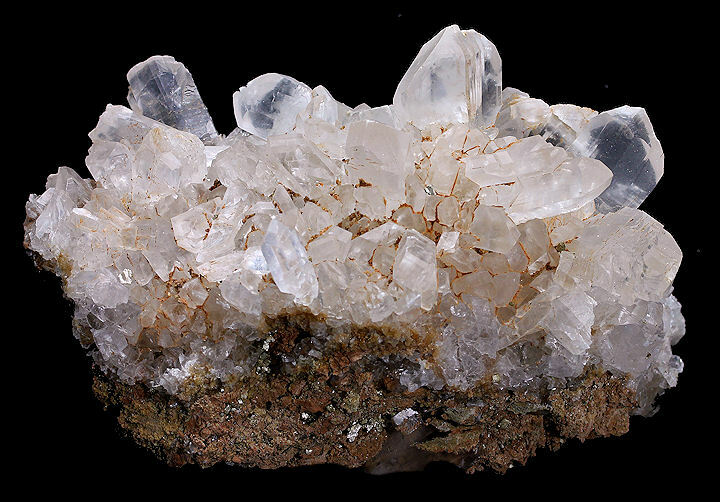 The area is highly mineralized (the Colorado Mineral Belt) and figured in the gold and silver mining industry of early Colorado. 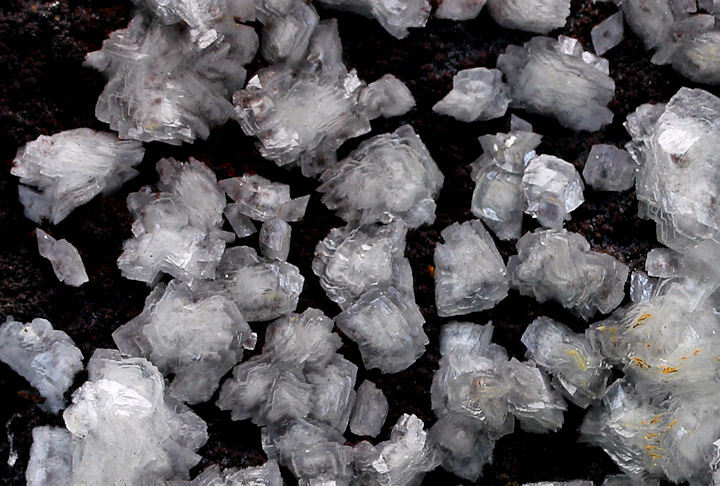 Major towns, all old mining camps, include Creede, Lake City, Silverton, Ouray, and Telluride. 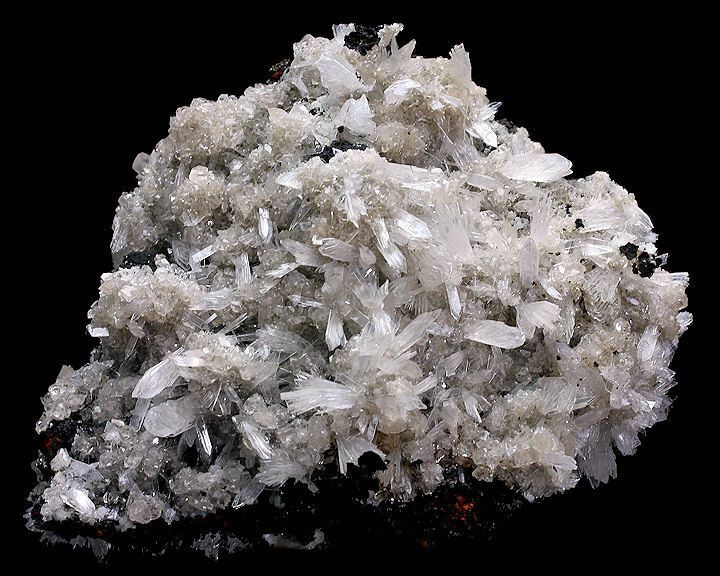 Large scale mining is now uneconomical in the region, although independent prospectors still work claims throughout the range (From Wikipedia, the free encyclopedia). 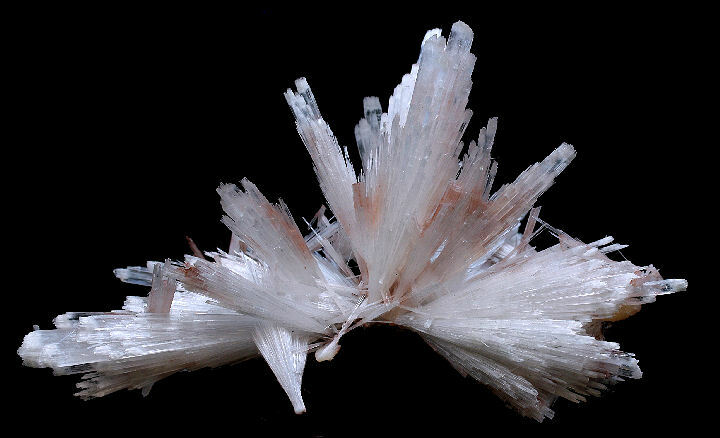 Fine, attractive, classic, large, sharp, translucent, off-white color, radiating aggregates and "pinwheels" on Limonite. 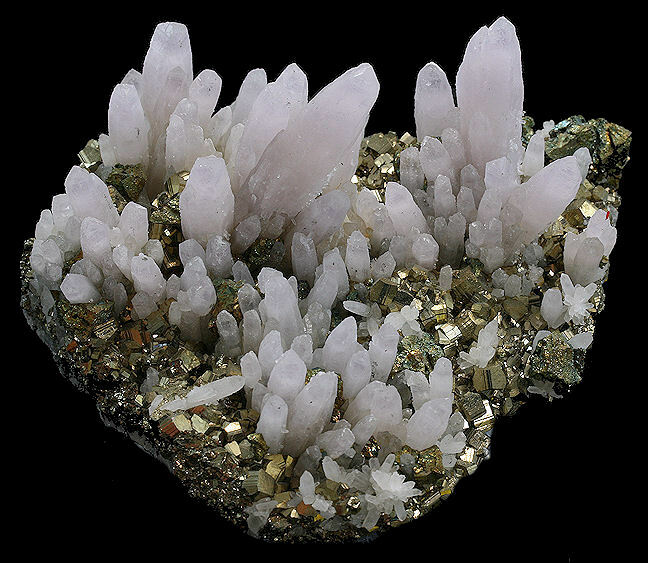 Fine plate of pale Amethyst crystals in excellent condition on Pyrite and Chalcopyrite. 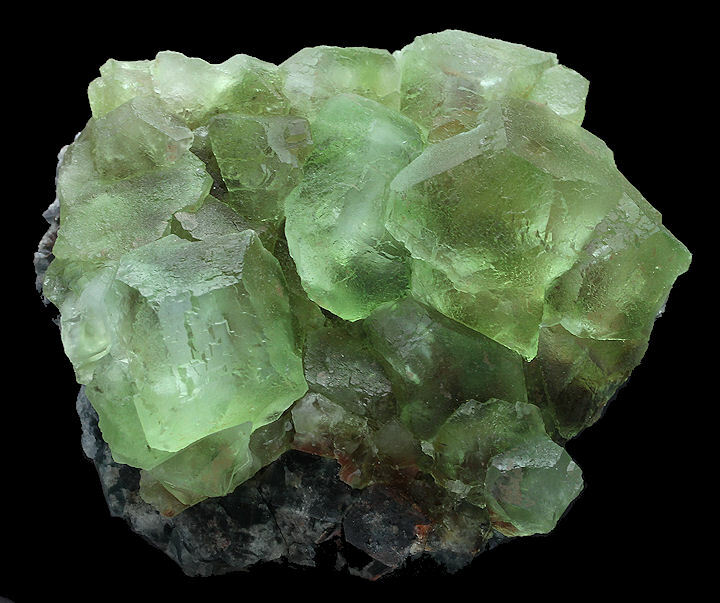 Click here for information on Rosasite. 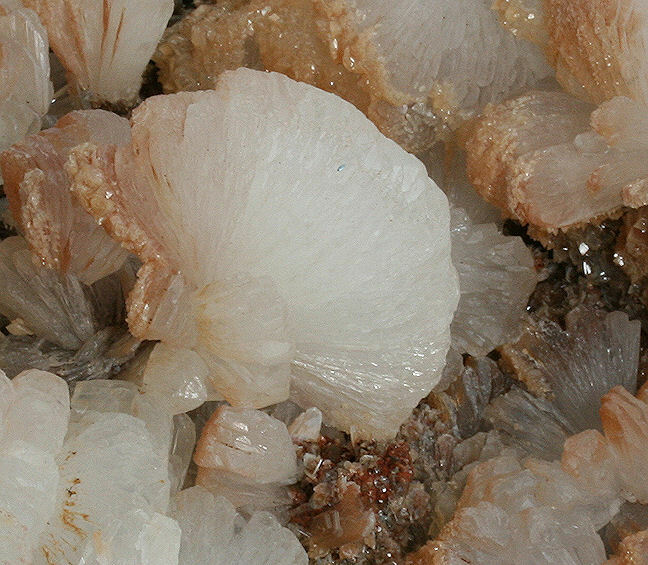 Very aesthetic coverage of red and orange tinted Stilbite crystals on glistening White Chalcedony. 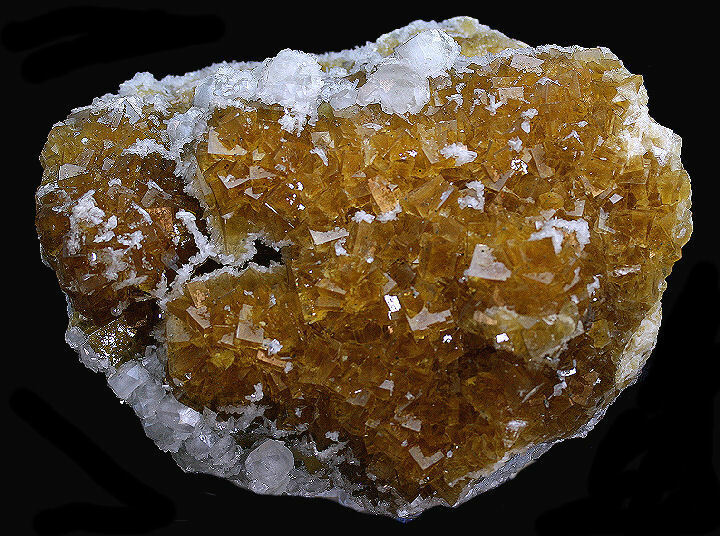 Stunning large cluster of lustrous, gemmy, golden Fluorite crystals with nice trim of Calcite crystals from the famous Moscona Mine. In excellent condition. 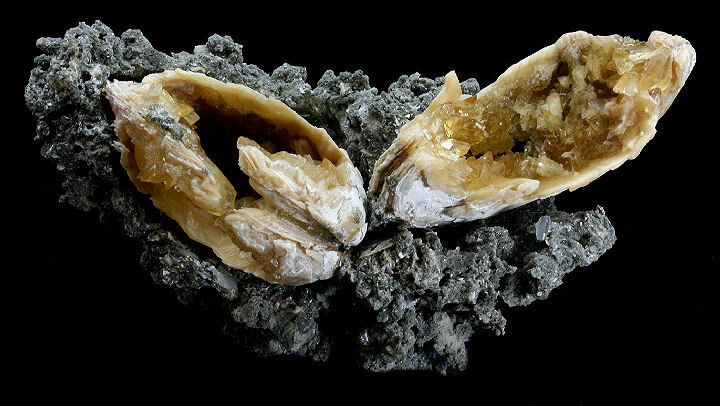 Fine presentation of golden Calcite crystals on two fossil Clams attached to coral substrate. 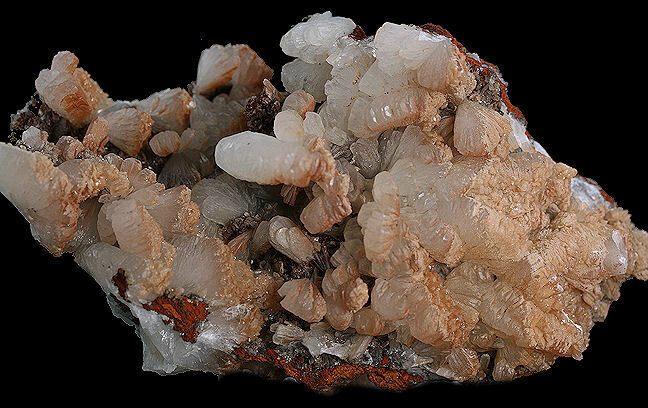 Absolutely stunning large bursting cluster of glassy Scolecite crystals with brown highlights that is, I guarantee, even more stunning in person. It is more sturdy than it looks, having arrived to me from India totally intact. I also have a method for safe shipping of these type of specimens. Definitely the best of its type I have ever had in my possession. 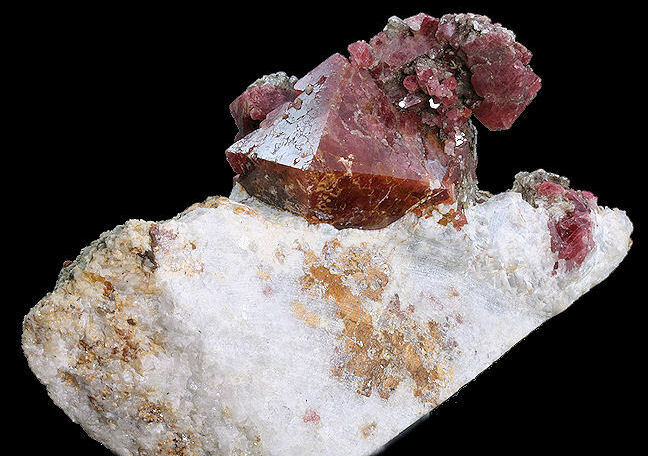 Sharp, large, lustrous, dard pink-red octahedral crystal of Spinel (2.5 x 2x 2 cm) with smaller crystals on matrix. 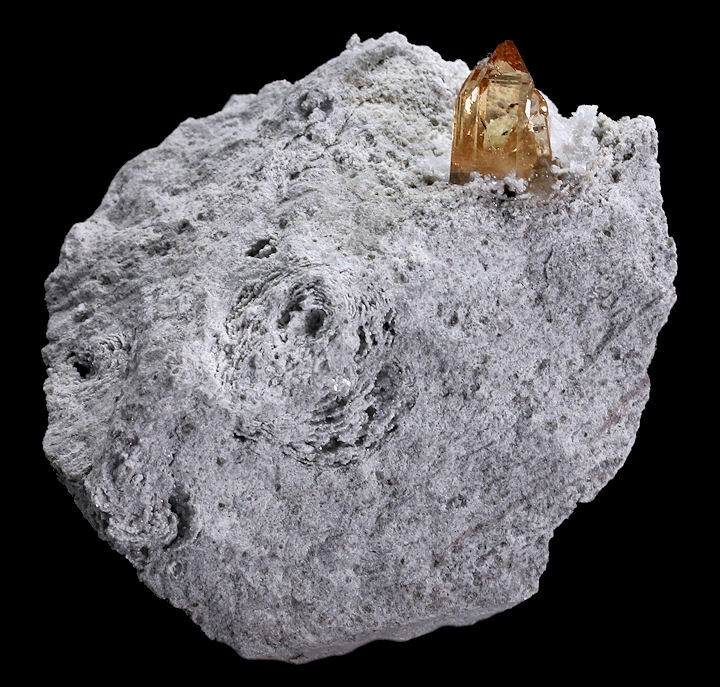 Unusually large pseudomorph specimen of Siderite, which has replaced and taken on the shape of original Calcite crystals.